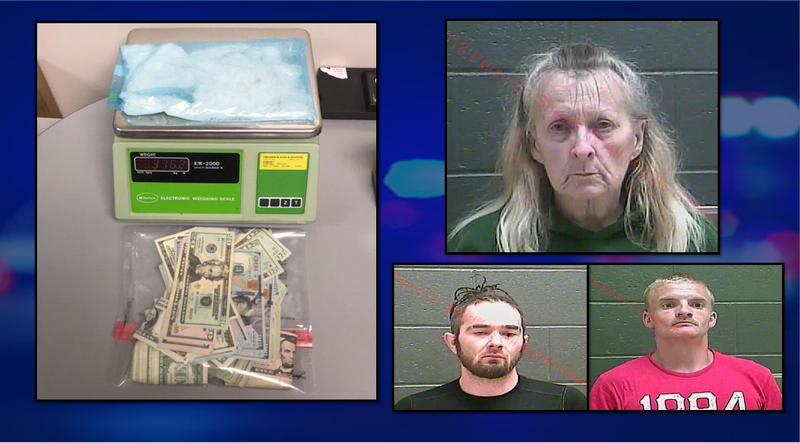 PERRY COUNTY -- More than $30,000 in meth were uncovered during a traffic stop last week and now two Jasper men are in jail, along with a Huntingburg woman. Indiana State Police released information yesterday about the incident, which occurred on Thursday of last week. State Police stopped a car driven by 27-year-old Jakob Batchelor of Jasper on I-64 in Perry County for speeding through a posted construction zone. Arrest reports show officers became suspicious about drug activity and called in a K-9 for an open-air sniff. The dog alerted to drugs in the car and police conducted a search. Troopers found nearly 316 grams of meth inside, along with paraphernalia and an undisclosed amount of cash. Batchelor was arrested along with two others in the car. They’re identified as 62-year-old Barbara Kelly of Huntingburg and 32-year-old Jeremey Siddons of Jasper. Batchelor is charged with felony counts of Conspiracy to Deal Meth and Maintaining a Common Nuisance. He’s also charged with misdemeanor paraphernalia possession. Kelly is charged with felony Dealing in Meth at Least 10 Grams, Conspiracy to Deal Meth and Possession of Meth – At least 10 grams with an Enhancement. She’s also charged with misdemeanor Visiting a Common Nuisance and Possession of Paraphernallia. Siddons is charged with Visiting a Common Nuisance and Possession of Paraphernalia. Those are both misdemeanors. You can see photos of the suspects and the drugs and cash over on our website, witzamfm.com.